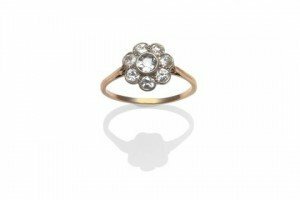 A Diamond Cluster Ring, eight old cut diamonds in white rubbed over settings, to a yellow tapered shoulder shank, total estimated diamond weight 1.20 carat. 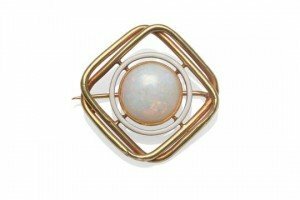 An Opal Brooch, a round cabochon opal in a yellow millegrain setting, to a white enamelled border, within a double square frame, measures 3.5cm by 3.4cm. 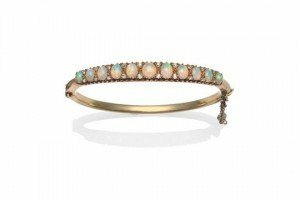 An Opal and Diamond Bangle, circa 1910, eleven graduated oval cabochon opals with pairs of old cut diamond accents between, hinged to a plain polished back. 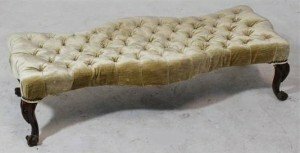 A Victorian walnut button upholstered shaped stool of serpentine outline raised on knee carved cabriole legs to scrolling feet, length 120cm. A late Victorian brass oil lamp with porcelain fluted urn shaped reservoir and with white opaque glass shade, height 60cm including funnel. 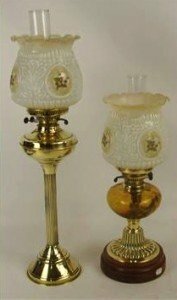 Two decorative brass oil lamps, the shorter with amber glass reservoir and on turned wooden plinth, both with white opaque transfer floral decorated shades. An early 20th century mahogany standard lamp with carved top above reeded column, above reeded lobed section to spreading circular foot, with pleated shade. 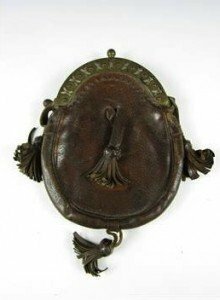 A late 19th / early 20th Century Scottish sporran, the brown hide bag having leather tassels and brass cantle pierced in a pattern of saltires. 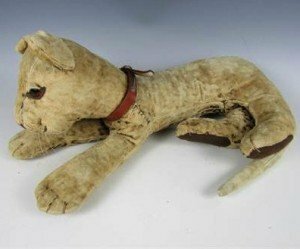 An early 20th Century plush leopard toy, in a recumbent position, having hooded glass eyes with felt nose and paw pads, excelsior stuffing, approximately 50 cm excluding tail. 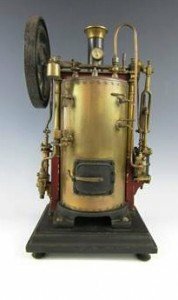 A late 19th Century live steam scale model stationary engine, having vertical boiler, single cylinder, water feed pump and overhead fly- drive-wheel shaft, on ebonised platform base. 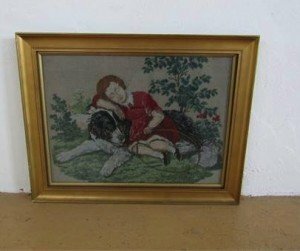 A Victorian sentimental gros point picture, depicting a recumbent child with toy hoop resting on a Newfoundland dog, framed and mounted under glass, 28 x 38 cm. 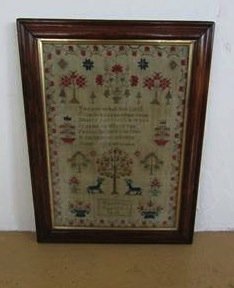 A Victorian sewing sampler worked by Hannah Davies and dated 1854, in cotton threads over linen, incorporating a central religious verse surrounded by fruiting tree and floral motifs, within a running strawberry border, framed and mounted under glass, 42 x 29 cm. 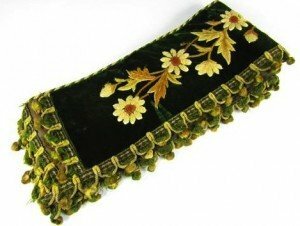 A Victorian hand embroidered velvet mantelpiece drape or pelmet, worked in long and short stitch in caramel wools over a green ground, and trimmed with matching brocade, 23 x 225 cm. 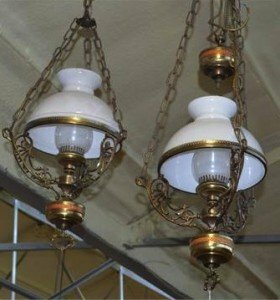 A pair of brass ceiling lamps with ornate pierced scrolling supports and white opaque shades, and a cut glass basket light fitting, diameter approx 20cm. 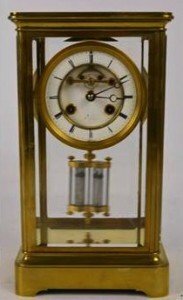 A French brass and bevelled glass cased eight day mantel clock, the circular skeleton enamel dial set with Roman numerals and with obscure makers mark. 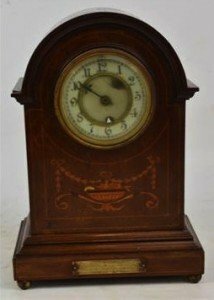 An early 20th century mahogany and inlaid dome top mantel clock, the circular dial set with Arabic numerals and bearing presentation plaque dated 1916. 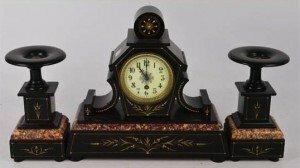 A late 19th century French slate and pink marble garniture, the thirty hour clock circular dial set with Arabic numerals on rectangular tapering base. 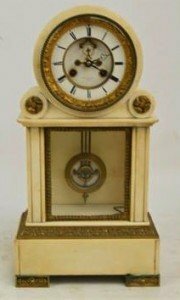 A late 19th century French eight day white marble mantel clock, the drum type case with white enamel chapter ring set with Roman numerals. 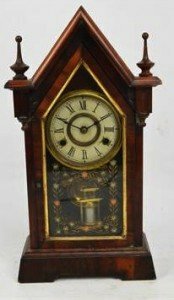 An American eight day mantel clock, the circular dial set with Roman numerals, with steeple pediment and turned finials, with floral transfer decorated glazed door above plinth base. 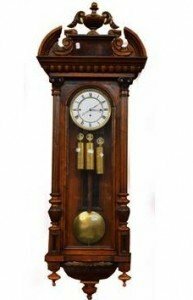 A late 19th century Vienna Grand Sonnerie three weight wall clock with urn set arched pediment above white enamel dial set with Roman numerals flanked by fluted pilasters with glazed door and turned finials.